This huge extravaganza is one of the largest and most prestigious cultural events in Australia, presenting the finest international artists and most acclaimed local talent in the performing and visual arts. Every summer the city's concert venues, theatres, galleries, streets and various outdoor venues are taken over by the creative arts, featuring a wide range of music, dance and drama, exhibitions, circuses and free outdoor entertainment in a celebration of artistic innovation unmatched anywhere else in the country. 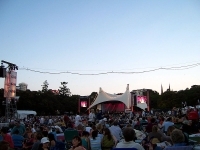 A free outdoor programme, including the enormously popular symphony and jazz concerts in the Domain, complements the ticketed events, and takes place in venues such as the Rocks, Darling Harbour and in front of the Sydney Opera House.